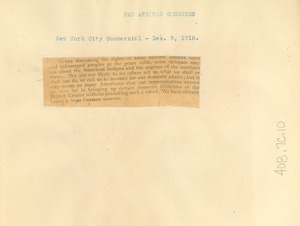 1527 results found for: subject:"Pan-Africanism--Congresses"
New York (N.Y.) - Clipping regarding the Pan African Congress from the New York City Commercial. 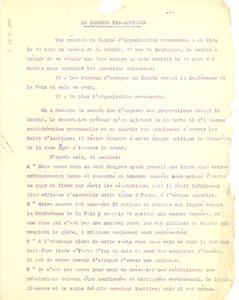 Paris (France) - Concerning a proposal for a Pan African Congress to be held February 2, 3 and 4, 1919. In French. Concerning the permanent organizational goals of the Pan African Congress. In French. 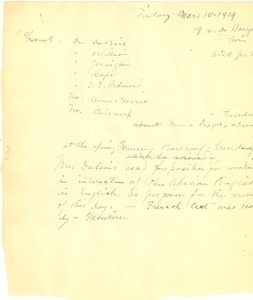 Missing page 2. 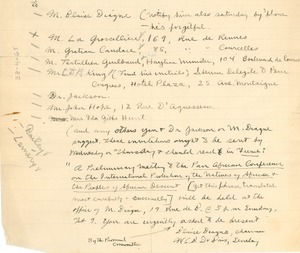 Notes of issues discussed at the London session of the Pan African Congress. Missing pages 1-3. 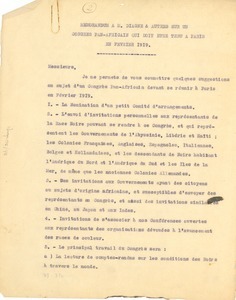 Paris (France) - Concerning a proposal for a Pan African Congress to be held February 2, 3 and 4, 1919. Paris (France) - Minutes, and list of attendees. 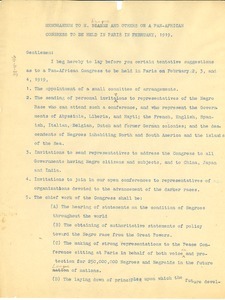 Draft of invitation to a preliminary meeting of the Pan African Congress to board members. 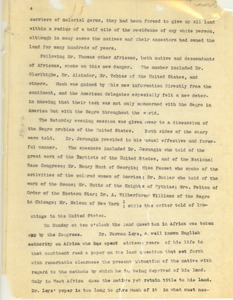 Contains instructions from Du Bois interspersed throughout the letter. 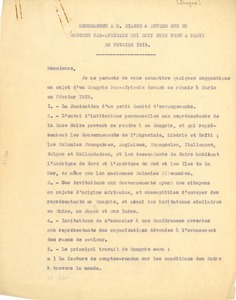 Paris (France) - Additional copy of a memorandum concerning a proposal for a Pan African Congress to be held February 2, 3 and 4, 1919. In French. 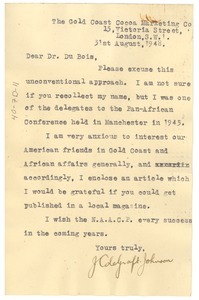 London (England) - Reminding him briefly of their meeting at the 1945 Pan African Conference in Manchester; enclosing an article which he hopes may be published in a local magazine; and wishing the best for the NAACP. 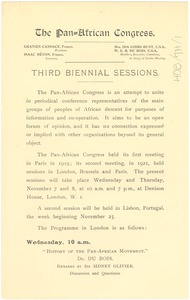 Topics to be discussed and participants of the London session of the third Pan African Congress. Participants include: W. E. B. Du Bois, Ida Gibbs Hunt, Harold Laski, Kamba Simango, Sidney Oliver, John Alcindor, Chief Amoah III, H. G. Wells, and J. H. Tawney.